Tom Corbett is the lead character in the series Tom Corbett — Space Cadet. The Tom Corbett stories were told on television and in radio, books, comics and comic strips during the 1950s. 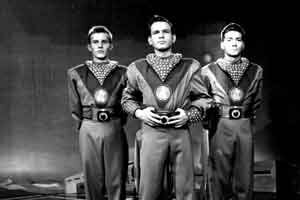 It was one of the first generation of space TV series. Cadets of the Space Academy are training to become fully fledged members of the Solar Guard. Adventures happen in the Academy’s classrooms and dorms, on board the rocket cruiser Polaris (a training ship), and on mind-bending alien planets.